Olga de Amaral, ''Pozo Azul 10,'' 2013, fiber, gesso, and acrylic paint, 27 1/2 x 29''. 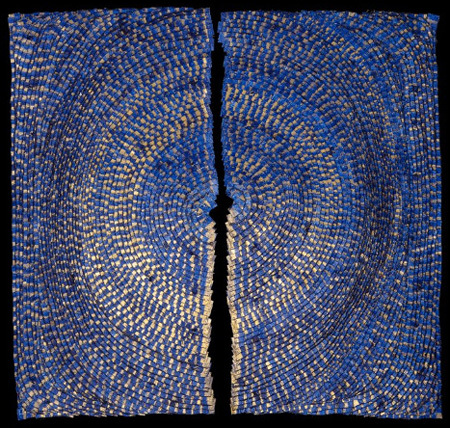 Celebrated fiber artist Olga de Amaral's latest collection, "Pozos Azules" ("Blue Wells"), is rife with cobalt and shimmery gold, approximating the iridescence of moving water. In the past, de Amaral used gold exclusively, and her work dazzled with an almost intimidating excess. "Pozos Azules" is decidedly more subtle, though there’s still enough of that halcyon shimmer to make King Midas blush. De Amaral’s hometown of Bogotá, Colombia, with its complex history and natural beauty, is often cited as a source of inspiration for her textiles. To wit, the juicy crimsons in "Sol Rojo 3" hearken to pre-Columbian textiles, typically abstract and shot through with color. "Pozo Azul 10" is like a blazing mandala or a spinning maze of blue and gold. In general, the surfaces of these works are replete with little slits, jags and hems that are uneven but never haphazard. All of these works are diptychs, hung on the wall like pairs of massive wings. This organic impression is augmented when the works are viewed at close proximity: the weft and weave of de Amaral’s surfaces resemble nothing more than scales or glistening feathers. Maybe de Amaral is inspired by ancient cultures, precious metals and curling jungle rivers, but it doesn’t matter. Her fantastically original works reside in realms of heightened magic and beauty, the origins of which are consummately untraceable.